A Bunpology – Hey, Look! A Writer Fellow! I’m in the middle of an unusually busy week, I’m afraid. My day job responsibilities and freelance projects are getting in the way of a proper post. I have also been called for jury duty, which isn’t helping matters much, either. Long story short, I am a blogging deadbeat. 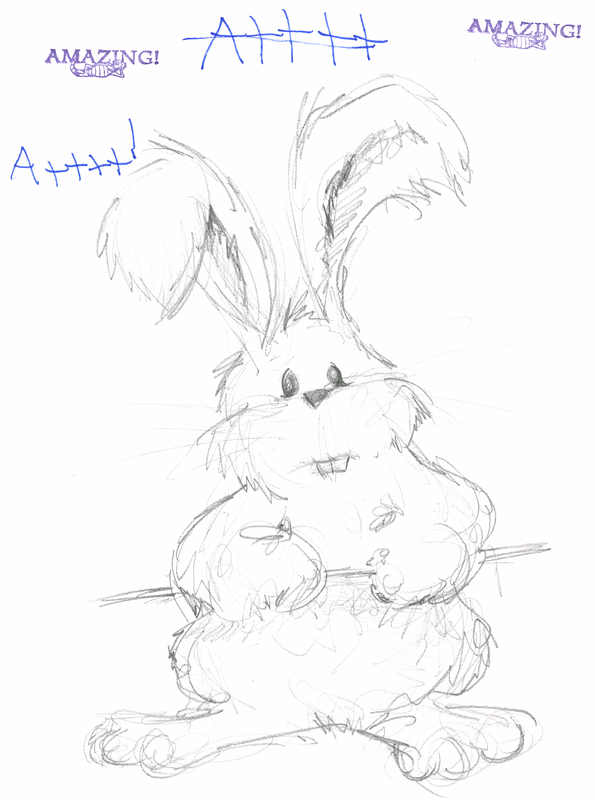 To make it up to you, I have doodled an excellent picture of a very fuzzy bunny. I know the doodle is excellent because my son gave it a very good grade. Now, if you’ll excuse me, I’m gonna go put it on the fridge. I should put the little fellow in spats and a top hat. That IS an excellent picture indeed. Hop, hop, hoppity hop, let’s all do the bunny hop! (I just made that up, with a tune too). Maybe the bunny can do jury duty for you. He doesn’t look too biased. The lawyers will love him! Bunnies don’t deserve to be subjected to such cruelty! You are not a blogging deadbeat. You’re a blogging genius, giving us a soft fuzzy bunny to keep us happy while we wait for your next wonderful posting escapade into your world. Perhaps it will deal with duties…. Give that boy some respect! Aha! I was called to jury duty, too, for a trial that is supposed to last 6-8 weeks. But after hours of cross examination of the potential jurors over the past two days, I was excused. Phewf! Apparently, someone didn’t like that I’ve written for nonprofits that work with disadvantaged youth or expose and attempt to rectify problems with our judicial system. I’m surprised you were excused. There is nothing judges like more than to be told they’re doing their jobs wrong. P.S. LOVE the bunny! Who doesn’t love bunnies?! P.P.S. Your son is brilliant. P.P.S. I concur. And your son is, too! P.P.P.S. Oh, you! And you are, too! P.P.P.P.S. Just draw Easter Bunnies on those cards and you’re all set. Great. Now I got that dang song stuck in my head. Too cute! Good luck with jury duty. I did that once with an incredible group of people. It was an amazing experience. So far the only thing I’m finding amazing is just how many people they are able to cram into this waiting room. Oh, yeah! I love the bunny. Your son has a good eye. I think I need one of those for my fridge. You might get your wish, Michelle. A new Win A Doodle contest will be coming soon! You are a super-genius blogger. Look at all these comments on a bunnydoodle! You are very kind, Ms. Peach, but those who know me can attest to my non-geniusness. Gerbils are very good at gnawing up homework. It takes ’em a little while, but they get the job done. I have done jury duty. The bunny well serves his/her noble purpose. Perhaps my next doodle can be a bunny prosecutor. Must be influenced by my recent reading encounter with Jonas but I’m seeing this as a pink bunny. Or the bunny reminds me of my slippers which are a frowsy pink. As for jury duty–always a story out of those. Hm. My next bunny will hafta be in color. Thanks! The bunny loves you, too. You know, there’s a lot of down time in Jury duty, while you wait to be pulled out of the pool—last time I was called, I outline half a novel. and took notes for a court scene. For writers, there’s always a graphite lining, yeah? Normally I would agree with you on this. Unfortunately, there are too many distractions here (jam-packed room, uncomfy chairs, cackling panelists on The View) to concentrate. Today is a reading day. Hiya, Courtney! I am delighted to hear that my doodle will be heading to the Wright Gallery. 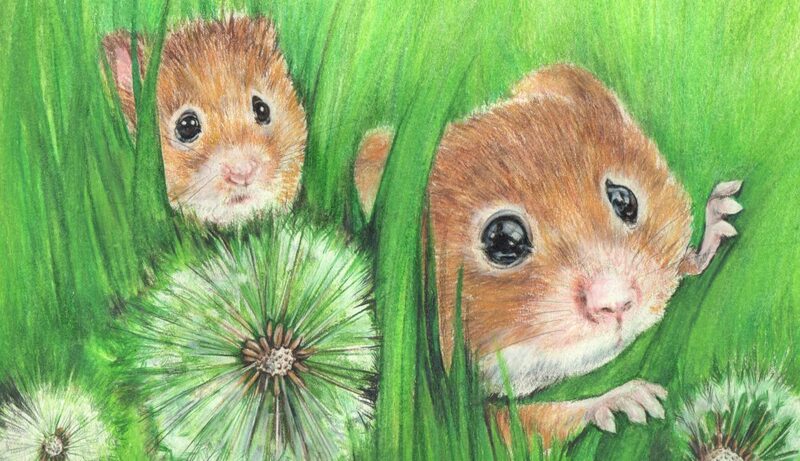 I am delighted to hear that you are pro doodle (proodle) and pro pig (prig?). You’re clearly my kinda person, too. So stay awhile. Have a scone. You seem like the kind of person who might get a kick out of Bat Dad. Have you ever seen it? The kid is hilarious, isn’t he? His vids are all over YouTube. So, if you want to waste an hour, that’s the way to do it. a creative and brilliant young tyke. his ‘bunpology’ we all really like. That sounds like at least two doodles. Don’t get greedy, kid! Bunny is so cuuuute! I’d love to walk by that little guy every day on my refrigerator. ❤ Here's to hoping your week slows down a bit. Thanks, Fox! And, yes, I can see the light at the end of the tunnel, overworking-wise. I’ve never been put on a jury, either. Every single time I have been summoned it’s the same story: I’m sent to sit in an overcrowded room in an uncomfortable chair where I spend the next eight hours fighting for an armrest. Never underestimate the orneriness of a rabbit. You’re sitting there doodling rabbits, while I can sit here and not be able to draw a realistic carrot. Darn. Keep trying! After all, what is my bunny gonna eat! This blog is most excellent, dude, and your kid is so rockin’ with his A+mazing grading on your seriously fuzzy bunny. I, too, find this sketch most excellent, even though I can’t tell what he’s holding. But having to sit for jury duty, I’m thinking your adventure took a most serious turn. For sure, having to be subjected to listening to a most unbodacious show such as The View, is most bogus for the likes of Mike “Michael” Allegra. You’ve done your time. Duty done, dude. Technically, the drawing is unfinished. My plan was to have Mr. Bunny peering over the top of a shopping cart. I drew the one bar so I’d know where to place his hands and then decided not to mess things up with the cage. So now he’s just holding a single bar. Tess thought the bar was a dancing cane, which I like. So I just gotta throw a couple more pencil marks on the drawing and it’s done. A pensive, bunny Fred Astaire. Life can get in the way sometimes. So turn that frowny face upside down! I don’t speak emoji, so, um, thanks? Haha! Love the bunny! You definitely deserve an A+. I got out of jury duty (twice) because I was breastfeeding, but I guess that won’t work for you lol ;).